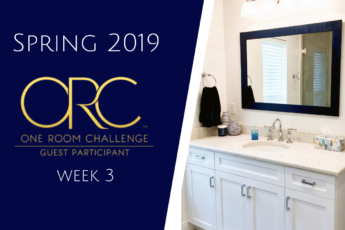 Welcome to Week 2 of the One Room Challenge! 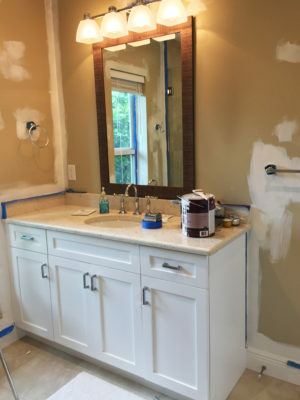 In case you missed Week 1, I talked about how I’ve chosen to transform our Guest Bathroom in this challenge. You can see all the other participants in the One Room Challenge here. 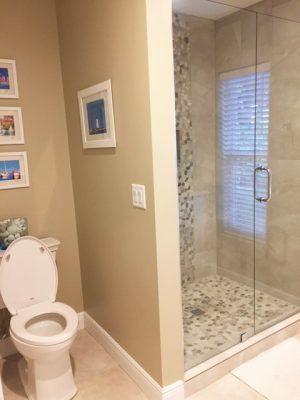 This bathroom got a total overhaul just a few years ago. 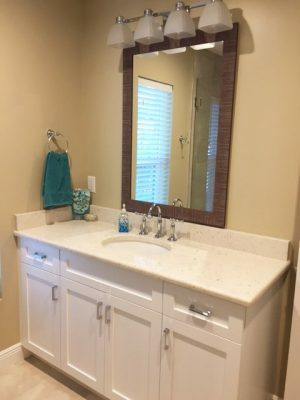 As a result, I will not be replacing the vanity or shower since they are already in great condition. However, I will be painting and redecorating this space. The color in here was never my jam and the whole space was very blah and boring. 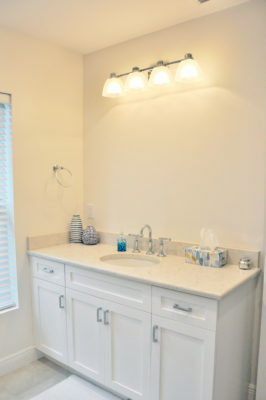 I am going for a nautical, coastal vibe using white and navy blue with vintage accents and accessories. I’ve been wanting to paint this space for so long and because of this challenge, I finally did it! Ya me! 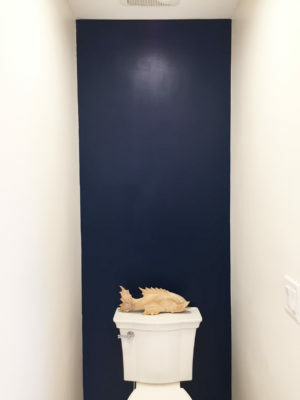 I used Antique White on the walls and Nocturne Blue for the accent wall behind the toilet. It looks so much brighter in here without that weird beige/almost mustard color we had before. I have to admit I was a little freaked out with the Nocturne Blue at first. The first coat went on a bright teal! However, after several coats it dried into a beautiful navy! 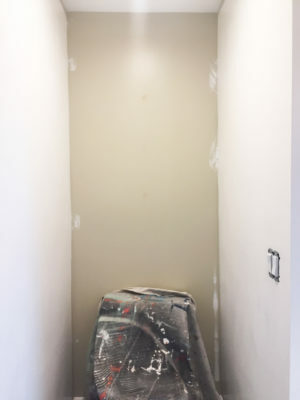 Here are some photos of my progress. Looks so much better already. Don’t ya think? 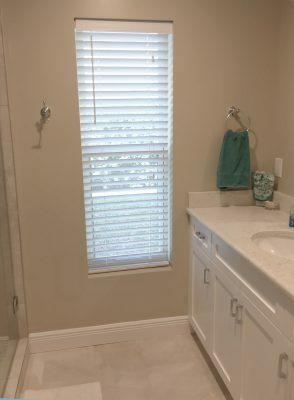 Find or make a new window treatment. Need to work on this. We have guests arriving tomorrow and will be here for 4 days this week. It will be hard to get much done, but I will sure try. 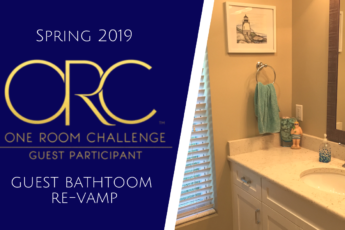 Check out all the other participants in the One Room Challenge here. Stayed tuned for Week 3. Love the blue acent wall well done! 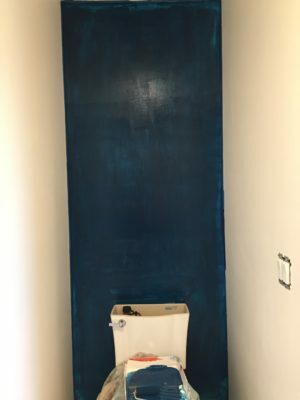 Love the deep dark blue wall! So pretty!!! Thank you! I’m loving it too!